HubSpot has popularized the inbound marketing methodology. Prospects start off as strangers, then become visitors and leads; from there they become customers, and finally promoters. The methodology tightly aligns with the sales and marketing funnel employed by companies that seek predictable, scalable growth. What’s interesting about both methodologies is that they are viewed heavily from a corporate, rather than customer perspective. It’s important that you align your approach with your customer’s perspective as well. Several years ago I was working with a number of clients building out the alignment between the marketing, lead generation and sales efforts. In the process, we crafted the buyer’s journey from their perspective. You can see the full results of that effort in this 30-minute video on The Sales & Marketing Model. 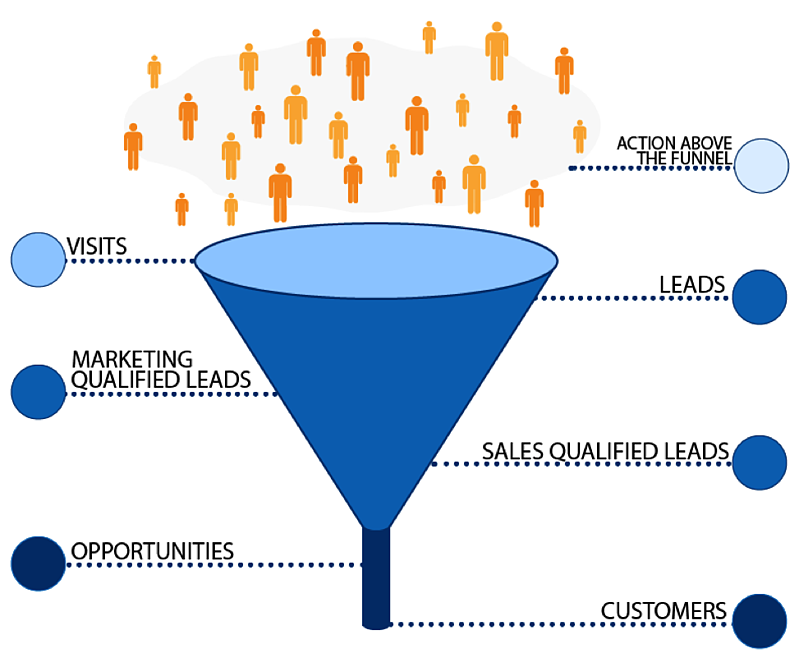 While the traditional funnel provides the metaphor of gravity pulling prospects through your funnel (which a properly implemented inbound marketing approach should do), the diagram from the buyer’s perspective provides the metaphor of a more purposeful effort to move through the phases. The customer’s journey begins with awareness. Obviously if someone doesn’t know that you exist or what you do, it’s highly unlikely they’ll ever buy from you. Your goal in the awareness stage is to draw attention to your message and content, as well as your value and selling propositions. Keep in mind that your customers are not thinking about their problems or opportunities through the lens of purchasing something. When you’re communicating in the awareness stage, you’re messaging better be all about them. All awareness is not created equally. The real job of your marketing is to create awareness that matters. When your prospect becomes aware of you they make a quick, often subconscious, decision that will have a tremendous impact on your future. They decide whether you’re worth giving attention to, or not. When they decide to give you, your company or your content attention, they move to the engagement stage. When you’re putting your inbound marketing strategy together, the goal of all of your awareness tactics should be to “earn your prospect’s attention.” Here are three tips to do so effectively. Ensure that you have clearly articulated buyer personas. Be sure that your message and content are aligned with what really matters to the persona you are trying to connect with. Be sure to deliver a challenge-message. An important thing to understand about the engagement stage is that it’s often done anonymously. Engagement begins “above the funnel.” The prospect knows who you are, but you do not necessarily know who the prospect is. To succeed at this stage, you must share valuable content that is not put behind registration walls or landing pages. This is one of the reasons blogging is so important. As your prospect engages further with your content and you continue to create value for them, trust is being built. At some point along the path your prospect will become willing to identify his or herself to you. It might be something as simple as sharing their email address to subscribe to your blog or newsletter, or sharing more details by downloading a white paper or registering for a webinar and so on. The volunteer stage is all about lead nurturing and management, and aligns with the middle of the marketing funnel. This is where developing conversion paths become increasingly important. The more you’ve thought through and built out easy paths for further engagement, the faster the prospect will move through your funnel. As you continue to create value, and deepen your alignment to their important problems and opportunities, the greater the likelihood will be that your prospect opens to the idea of engaging with you in a formal sales process. Think of the commit stage as a testing phase. This is the point where your prospect is willing to invest real time and energy (and in many cases money) into learning more about you, allowing you to learn more about them and to determine if your offerings are worthy of serious consideration. 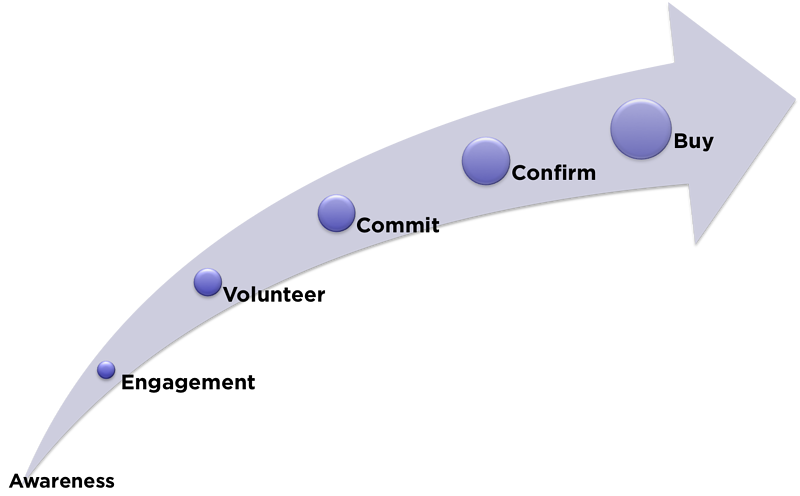 The commit stage represents the beginning of the formal sales process. The focus of your effort needs to be on highlighting the costs of the problems your prospect is trying to address. Design your sales process to align with this phase. Too often the only way a prospect can benefit from a selling organization is by becoming a customer or client. The problem with this is that it actually represents a very big step. The prospect not only has to decide that you’re worth buying from, they must also determine that change is required…and that’s scary. This is why assessments, trials and even demos are so effective. They allow a prospect to more deeply engage with you, and to even benefit from their interactions, without having to make the scary decision to change. Is the problem being solved here crucial? Are we making a safe choice? You’ve probably heard the quote, “No one ever got fired buying from IBM.” The reason is that IBM is a safe choice. While it’s certainly important that you demonstrate that you’re the best choice to solve the pressing problem; you must also demonstrate that you’re the safest. This means that you have to move beyond a “solution salesperson” perspective to being a real problem solver. You must enable your prospect to understand what’s causing the problem, the cost of the problem and demonstrate that the status quo is more risky than the change you’re recommending. You must also demonstrate that you understand where things can go wrong, and share how to minimize the likelihood of that from happening. The final step in the progression is the decision to buy from you (or not), and ultimately the decision of whether they’re happy with the choice they made. As you build out your go-to-market and inbound strategy, be sure to align your efforts to your customer’s approach and you’ll see your results soar.